Top seeds continue to fall at the Rip Curl Pro Bells Beach, Stop No. 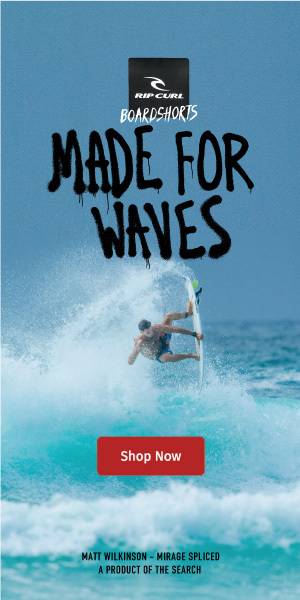 2 on the World Surf League (WSL) Championship Tour (CT), after completing men’s Rounds 3 and 4, and the women’s Quarterfinals in four-to-six foot (1.2 - 2 metre) conditions. This twesday witnessed all but three WSL Championships dispatched with John John Florence (HAW), Joel Parkinson (AUS), Adriano de Souza (BRA), and Carissa Moore (HAW) out of the draw. Now, only Mick Fanning (AUS), Stephanie Gilmore (AUS), and Gabriel Medina (BRA) represent the class of elite World Champions heading into the Final Series of the iconic Rip Curl Pro Bells Beach event. Two-time, reigning WSL Champion Florence is out of the Rip Curl Pro Bells Beach after losing to compatriot Ezekiel Lau (HAW) in the opening heat of the day. In Round 3 Heat 7, Lau put the pressure on Florence by jostling for position. Lau’s physical assertion seemed to throw Florence off his game as he struggled to find a wave of substance. Lau, on the other hand, looked confident and powerful in that heat as well as in Round 4, where he defeated Frederico Morais (PRT) and Conner Coffin (USA). Last season, 25-year-old Florence locked in 3rd place results on the Gold Coast and at Bells Beach, but uncharacteristically, has yet to surpass 13th place in 2018. As the defending event winner of the next stop on the WSL CT, the Margaret River Pro, Florence is out to repeat his groundbreaking performances and reboot his World Title campaign. 2012 WSL Champion Joel Parkinson (AUS), 36, was eliminated from the event by CT sophomore Morais, 26, in Round 3 Heat 8. The veteran struggled to complete his rides, allowing the newcomer to take the win with only mid-range scores. The three-time Bells winner who has not missed a Bells event since 2001, exits in Equal 13th place. The upsets continued with Adriano de Souza’s (BRA) elimination following Parkinson's heat in Round 3. Californian Coffin ousted the 2014 WSL Champion by just 0.2 points with a 9.83 combined score (out of a possible 20). In the year he won the World Title, De Souza earned four 13th place results, so the Brazilian could make a huge comeback at the Margaret River Pro, where he is a former event winner. After completing Round 3, event officials decided to switch to Winkipop, the backup event site that offered more opportunity over the lunchtime hightide for men’s Round 4 and the women's Quarterfinals. Three-time WSL Champion Fanning took to the water in Round 4 Heat 2 to edge closer to a fairytale fifth Bells trophy in the last event of his competitive career. Fanning fought off stablemate Matt Wilkinson (AUS) and comeback-kid Patrick Gudauskas (USA). Gudauskas made a quick start locking in two 7.00 rides with some solid wave selection, whilst 2016 event winner Wilkinson posted a 7.50 to get the ball rolling. Fanning waited patiently and demonstrated why he is a three-time World Champion with big turns across the Winkipop walls to take the win. Fanning and Gudauskas will move to the Quarterfinals, while Wilkinson ends his Bells run in Equal 9th. Fanning will take on good friend Owen Wright (AUS) in the Quarterfinals. Fanning is now the only surfer left in the men’s draw that has rung the Bell before. The last heat of Round 4 pitted dynamic Brazilians Italo Ferreira (BRA) and Gabriel Medina (BRA) against Jeremy Flores (FRA) in a high-intensity battle for a slot into the Quarterfinals. Ferreira was quick to get started with a 7.50 (out of a possible 10) off the bat. However, Medina kicked into gear late in the heat to score a 7.00 and clinch the lead. He and Ferreira took the top two progressing spots to knock out Flores. Round 4 started with a bang as Michel Bourez (PYF) took down Wright and rookie Wade Carmichael (AUS). Bourez looked at ease at Winkipop as he ripped his way through the long walls with his trademark powerful style. A 15.77 heat total saw Bourez take the win and move straight through to the Quarterfinals along with Wright. The opening women’s Quarterfinal saw two former Rip Curl Pro Bells Beach winners, Moore and Silvana Lima (BRA), go head-to-head in a battle to ring the Bell again. The two went score-for-score, each exchanging the lead until the dying minutes of the heat. Needing a 5.53, Lima took a wave in the final seconds of the heat to post a 7.27 and win her spot in the Semifinals. The three-time WSL Champion walks away with her second 5th place finish this season. Johanne Defay (FRA) barely missed the mark against 2018 CT Rookie Caroline Marks (USA) in their tight Quarterfinal battle. Less than two points separated Defay from advancing past the Quarterfinals, giving Marks her first CT Semifinal appearance. Six-time WSL Champion Stephanie Gilmore (AUS) closed out the day with a win in the final Quarterfinal matchup against Sage Erickson (USA). Gilmore handled the challenging Winkipop conditions with powerful turns and control for a 13.36 combined score over Erickson’s 11.07. CT veteran Gilmore will be up against rookie Marks in the Semifinals. Tatiana Weston-Webb (HAW) continues her run at the Rip Curl Women’s Pro by taking out Nikki Van Dijk (AUS) in the Quarterfinals. With Van Dijk out, Victorians will have to wait another year to see if one of their own will ring the Bell, a feat that hasn’t been achieved since Gail Couper did in 1976. Event organizers will reconvene Thursday morning at 6:30 a.m. AEDT for a possible 6:45 a.m. start. According to the Oficial WSL forecast, another good pulse of SW swell moves in Wed/Thurs to maintain solid overhead sets. A slow easing trend will ensue once again over the second half of the week, but still providing very contestable surf. Mornings will generally offer the best conditions with favorable offshore wind and lower tide.